TOWN CENTRE OFFICE PREMISES IN PERIOD BUILDING. The premises are located overlooking Church Square, in the heart of the town with parking to the front in Church Square and to the rear in a private security controlled car park. The town post office is opposite and the town centre shops close by. Milton Keynes, Aylesbury and Hemel Hempstead are all within 30 minutes drive of the property and the M25 is within 40 minutes drive, and the M1 within 15 minutes. The premises are in a terrace close to All Saints Church and overlooking Church Square, Leighton Buzzard. This is one of the, if not the most architecturally impressive buildings in the town, being an Italianate terrace originally constructed by the Bassett family as town houses in 1855. This property is listed and retains many of its attractive original period features, including staircases and fireplaces. 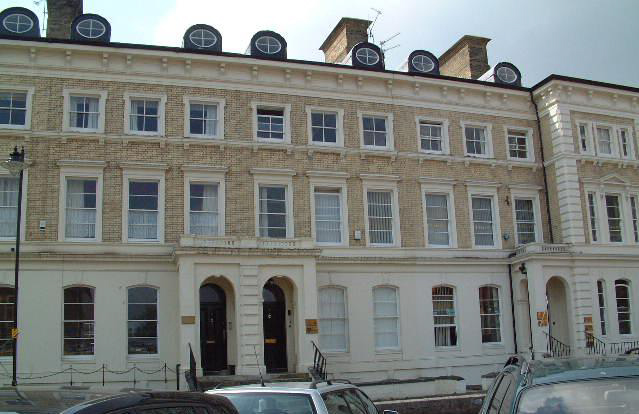 The property is on five levels with a basement which has been fitted out as office accommodation, to rooms on the first floor, two on the first and second floors and a storage area on the third floor which could also be converted to offices. WC’s in basement and on first and third floor levels. Full radiator central heating is installed, generic network cabling is installed, and fitted carpets are laid throughout. The property has been rewired and had a new boiler fitted recently on the upper floor. At the rear there is a car parking area for 6 vehicles although this could be extended to 9 with tandem parking. There is also a public car park to the front in Church Square. A new lease is available on fully repairing and insuring terms. VAT: The property is not registered for VAT purposes.